That screech you hear from the sound system when you hold the mic wrong? That’s Audio Feedback. 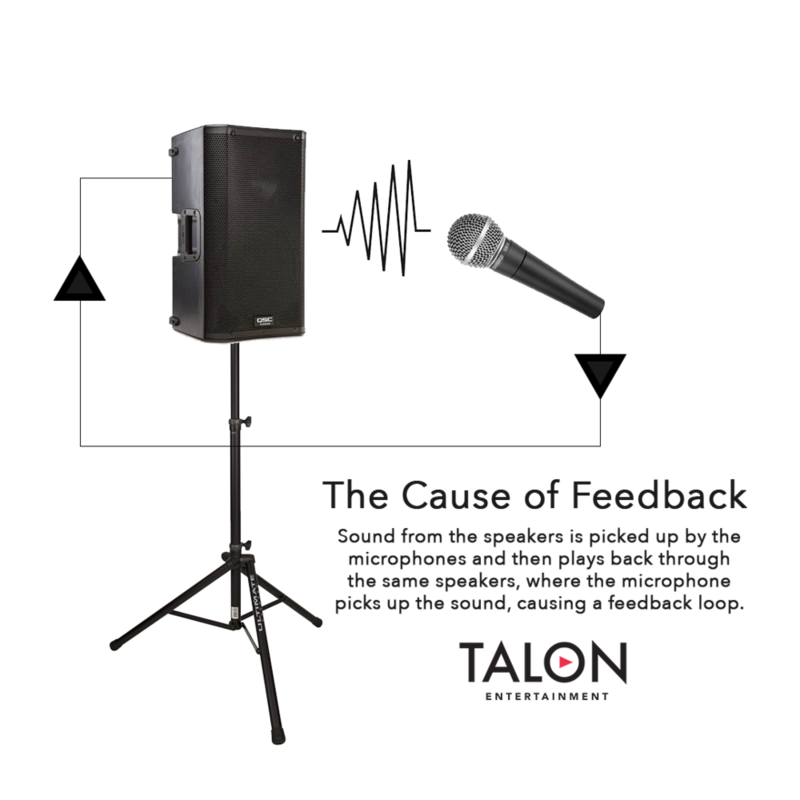 No, no, not negative comments -- Audio Feedback is when sound from the loudspeakers comes back into the microphone, creating a “feedback loop” and causing an awful howl. So I know what it is, but how do I prevent it? If you have a sound technician in the room, it’s their job to keep the screech away, but how do you prevent it when you’re on your own? Read on for some of the most useful tips to prevent microphone feedback at your events. Most microphones you’ll encounter at venues are “Unidirectional” - microphones that pick up sound from the front, and reject sound from the back. Make sure you keep the microphone on stage and that the microphone is behind the main speakers - Feedback is caused when the microphone picks up the amplified audio from the speakers, so make sure the mic can’t “hear” the sound from the speakers. If you speak closer to the microphone, it will pick up more sound from your voice compared to the background noise, increasing the clarity of your voice and reducing the chance for feedback. If you’re going to shout or belt out a loud note, make sure you back away a bit to avoid overpowering the microphone or sound system, which can cause distortion, and possibly damage. You get a lot more volume from your sound system without the risk of feedback when you have one mic on than if you have 4, or 20 mics turned on. Make sure you limit the number of microphones in use at one time by turning off or muting unused microphones. If you’re on a panel where you take turns speaking, you might mute your mic in between comments. Want more great tech tips like this? Sign up to get our next post by email. We promise not to share your email address with anyone, and we won't send more than one email a month, even if we post more often than that. Pinky Promise! Author Tim Kerbavaz is the owner of Talon Entertainment, a Davis, CA based Audio-Visual company. He can be reached by email at tim@talonent.com.